The Michael Flynn controversy went from zero to resignation in the blink of an eye. On Friday night, Donald Trump was asked about his national security advisor's pre-inauguration contact with a Russian ambassador and said he'd "look into" it. "I don't know about that," he said. "I haven't seen it." On Monday, senior Trump adviser Kellyanne Conway assured reporters that Mr Flynn had the president's "full confidence". Hours later, Flynn was gone and Conway was left explaining how the situation had become "unsustainable". Although this may be the end of Mr Flynn's tenure in the White House, it's just the beginning of the story. There are a number of questions that aren't going away just because Mr Flynn has. Why did Donald Trump wait to sack Flynn? According to the Washington Post, acting Attorney General Sally Yates had informed Trump White House counsel Donald McGahn shortly after inauguration day that surveillance of Russian Ambassador Sergei Kislyak revealed he and Mr Flynn had discussed US sanctions imposed by the Obama administration during their 30 December phone call. This ran directly counter not only to Mr Flynn's public denials, but those of other Trump administration officials, including press secretary Sean Spicer and Vice-President Mike Pence. So, if the Trump White House knew that Mr Flynn had lied - or, as he put it in his resignation letter, had "inadvertently briefed the vice-president-elect and others with incomplete information" - why did it take weeks, and multiple embarrassing media reports, for the national security adviser to be shown the door? During his press conference on Tuesday, White House press secretary Sean Spicer said Mr Trump had been informed that Mr Flynn had discussed sanctions with Mr Kislyak on 26 January and had instructed the White House counsel's office to investigate whether any laws had been violated. The conclusion was that that it was legal. Over the course of the ensuing weeks, however, Mr Trump's trust in Mr Flynn "eroded" to the point where he could no longer be effective as national security advisor. It was then that he was sacked. 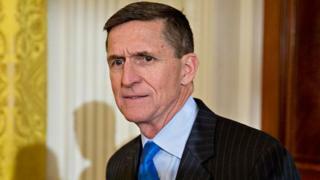 Those were weeks during which Mr Flynn was putting Iran "on notice", conferring tableside at Mar-a-Lago as the president and Japanese Prime Minsiter Shinzo Abe dealt with a North Korean missile launch and sitting front and centre in the East Room of the White House during Canadian Prime Minister Justin Trudeau and Mr Trump's joint press conference on Monday. Democrats in Congress smell blood in the water and are already calling for a sweeping investigation into the circumstances behind Mr Flynn's resignation. "The American people deserve to know the full extent of Russia's financial, personal and political grip on President Trump and what that means for our national security," House Minority Leader Nancy Pelosi said in a press release. Although Democrats would prefer a new congressional special committee be created to investigate the matter, that seems unlikely at this point. There are already planned investigations into the larger question of whether Russia interfered with the 2016 US presidential election, to be conducted by the House and Senate intelligence committees. "I think we should look into it exhaustively," said Senate intelligence committee member Roy Blunt of Missouri, "so that at the end of this process, nobody wonders whether there was a stone left unturned and shouldn't reach conclusions before you have the information that you need to have to make those conclusions." The House investigation will look into Russian intelligence activities and "links between Russian and individuals associated with political campaigns", according to a letter signed by the Republican chair and ranking Democrat on the committee. John McCain and Lindsey Graham, two senators on the armed services committee, are also launching their own inquiry. "General Flynn's resignation also raises further questions about the Trump administration's intentions toward Vladimir Putin's Russia, including statements by the president suggesting moral equivalence between the US and Russia," Mr McCain said in a press release. Other Republicans in Congress seem less interested in the matter. Jason Chaffetz, the chair of the House Oversight Committee who made recent headlines with his pledge to continue investigating Democrat Hillary Clinton's email server, has so far declined from launching an inquiry into Mr Flynn's resignation. "It's taking care of itself," he said. Of perhaps greater concern for the White House is the status of a reported FBI investigation into Trump campaign ties to the Russian government. According to the Post, FBI Director James Comey was reluctant to inform the Trump White House about evidence contradicting Mr Flynn's accounts because "it could complicate the bureau's ongoing investigation". Although the BBC has reported that there is a multi-agency probe into Russia and the 2016 election, there's never been an on-the-record confirmation of this by government officials. Could the inquiry include a look at whether Mr Flynn violated the Logan Act, a 1799 federal law that prohibits "unauthorised citizens" from negotiating with foreign governments? Given that the law has never been used in an actual prosecution, that seems unlikely. The more the FBI asks questions, however, the greater the temptation for Trump administration officials to mislead or misstate in order to avoid further political fallout from the matter. That could open the door for obstruction of justice charges. It wouldn't be the first time a cover-up of a political scandal turned into a criminal case. Or the second. Or the third. As this story unfolds, Mr Flynn and the rest of the Trump team may want to look back and see whether this whole mess was preventable. Forget, for now, the puzzler that Mr Flynn, who once served as director of the Defence Intelligence Agency, was seemingly unaware or unconcerned that phone conversations by the Russian ambassador to the US might be under government surveillance. Could he have just come out and admitted that he did, in fact, talk with Mr Kislyak about sanctions as part of a wide-ranging discussion of US policy priorities under soon-to-be-President Trump? Perhaps. There certainly would have been political fallout. Democrats would have cried bloody murder, given their sensitivity to the outcome of the Clinton-Trump campaign. They would have accused Mr Flynn of undermining Mr Obama's efforts to punish Russia for its alleged meddling and, in all likelihood, questioned whether the move constituted a violation of the Logan Act. In addition, there would have been further calls for a full investigation into Mr Trump's relations with Russia's Vladimir Putin and allegations of pre-election communications between the Republican's senior campaign officials and the Russian government. What seemingly undid Mr Flynn, however, was that Mr Pence and other Republicans had framed their defence of the general based on his insistence that sanctions definitely were not discussed. Mr Flynn embarrassed the vice-president, who wields enormous influence in the administration. A united White House may have been able to ride out this storm. As soon as it fractured, Mr Flynn was finished. Who will be the next national security adviser? Mr Flynn was one of the Mr Trump's most trusted advisers on national security, since the early days of the presidential campaign, and he will be difficult to replace. The president has alienated much of the conservative foreign policy establishment and appears unwilling, at least so far, to consider enlisting the aid of experienced hands who actively worked against him during the campaign. Following Mr Flynn's resignation, the White House announced that Keith Kellogg, who was serving as chief of staff of the National Security Council, would take over as acting national security advisor. Image caption Keith Kellogg is taking over for Michael Flynn on a temporary basis. Since retiring as a general from the Army in 2003, Mr Kellogg had worked for a variety of defence contractors and advised Mr Trump on foreign policy matters during the presidential campaign. Although Mr Kellogg will have the advantage of incumbency while the formal search is conducted, another high-profile name has already been floated for the job - former CIA Director David Petraeus. That, it seems, has not been a career-killing event, however - even though Mr Petraeus would have to get approval from his parole officer before taking a job in Washington. Robert Harward, a former deputy commander of US Central Command, is reportedly also under consideration. Whomever Mr Trump selects for national security adviser will be thrust into a key role in the administration's foreign policy team under less than ideal circumstances. The job requires the ability to co-ordinate multiple intelligence and security agencies with competing interests and priorities. The NSA has to be a diplomat and a facilitator, making sure the president is kept abreast of all relevant national security developments and his policy directives are effectively implemented. It's not a job for the faint of heart even in the best of times. How does Sally Yates feel right now? In late January Ms Yates, an Obama administration holdover who was serving as acting attorney general, advised the Trump administration of problems surrounding Mr Flynn's role as national security adviser. On 30 January Ms Yates announced that she would not enforce Mr Trump's executive order barring entry to the US for individuals from seven predominantly Muslim nations, warning that she considered the action of questionable legality. She was fired by Mr Trump later that day. Now the president's immigration order has been indefinitely suspended by multiple courts, which have said it may violate constitutional rights. And Mr Flynn is gone. We already know the answer to this particular question, actually. Ms Yates probably feels pretty vindicated.